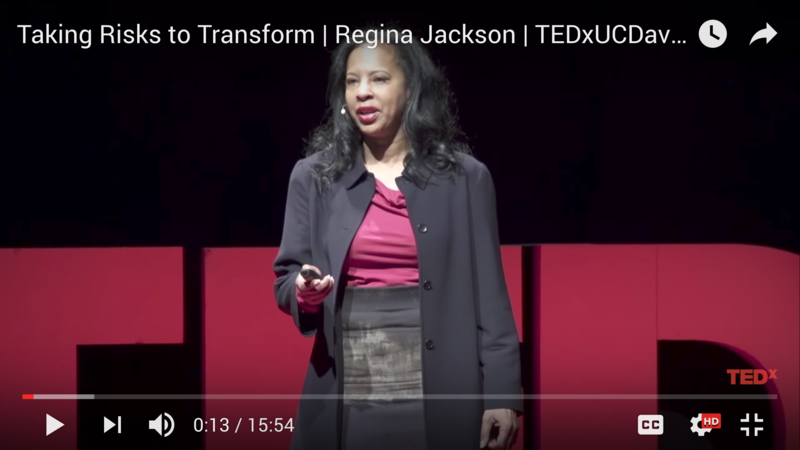 Regina Jackson takes us from Deep East Oakland in California to the Far East in China to understand the importance of taking risks and how doing so can support us all in becoming better versions of ourselves. Her proposed transformation process while applied to the youth perspective demonstrates global application. President and CEO Regina Jackson has set the strategic direction for the East Oakland Youth Development Center’s (EOYDC) national youth development model for more than 23 years. Focused on character-based leadership, her platform of youth-led initiatives have empowered thousands of young people to achieve lifelong academic and career success. A global thought leader for youth development, Ms. Jackson is often called upon as a subject matter expert to deliver workshops, presentations, and papers, both domestically and internationally. At the behest of U.S. Congresswoman Barbara Lee, Ms. Jackson recently led two delegations of student ambassadors to China in support of President Obama’s “My Brother’s Keeper” and “100,000 Strong” initiatives. Since the beginning of her tenure, EOYDC’s staff, Board of Directors, community leaders, and clergy have described Ms. Jackson’s leadership as “a stabilizing force for EOYDC’s curriculum and a positive anchor for the challenges of the twenty-first century.” Her successful strategies have tremendously benefitted urban, multicultural, and even international youth. Dr. Jackson recently received an honorary doctorate in Humane Letters from the University of San Francisco and has been featured on ABC-TV World News Tonight, Essence Magazine, and Parenting Magazine. Look for her upcoming TEDx on “Taking Risks to Transform” March, 2017. Dr. Jackson is the mother of two adult sons.